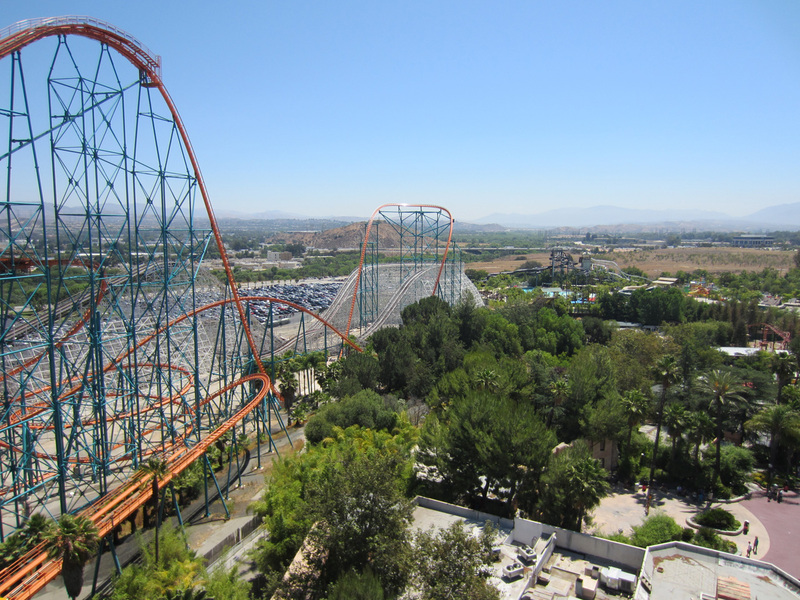 Six Flags Magic Mountain has more roller coasters than any other theme park on Earth. 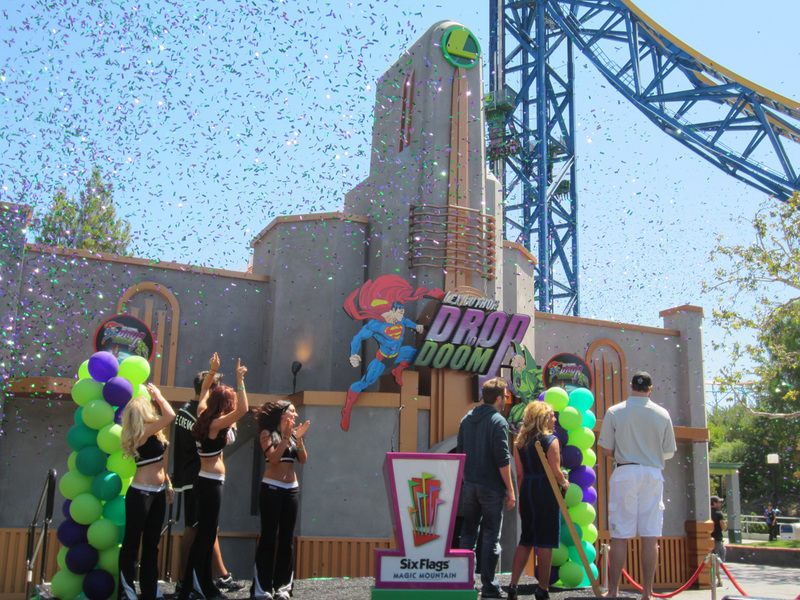 Yet their big new addition for 2012 is a freefall tower. Certainly not a roller coaster by any definition, why would the “Roller Coaster Capital of the World” add a drop ride instead of one of their specialties? The answer is apparent once you ride it; this behemoth is as thrilling as anything else in the park. 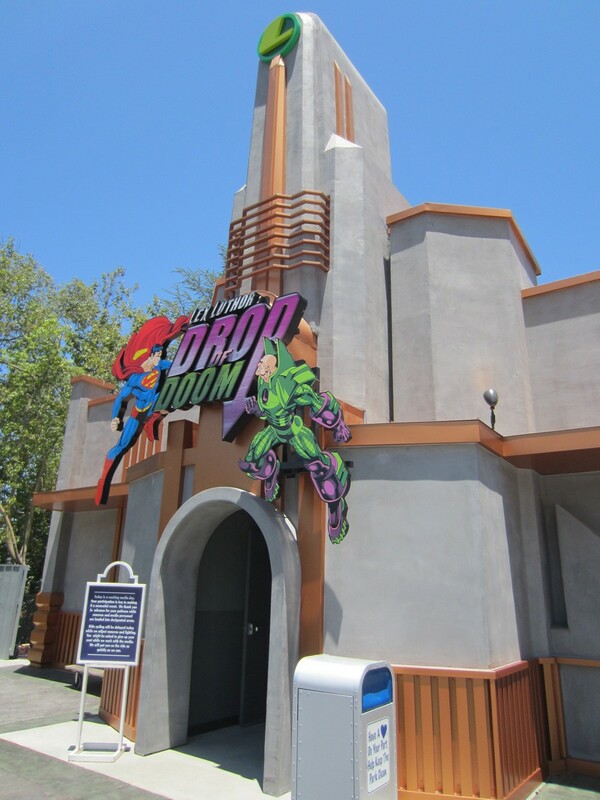 Making his theme park debut, Lex Luthor’s new ride is a great thematic fit for the DC Universe section of Magic Mountain. Not only that, but it fits perfectly into the geography of the park, acting as a bridge between the DC Universe and Superman: Escape from Krypton (which was built outside the DC Universe before that section of the park existed). 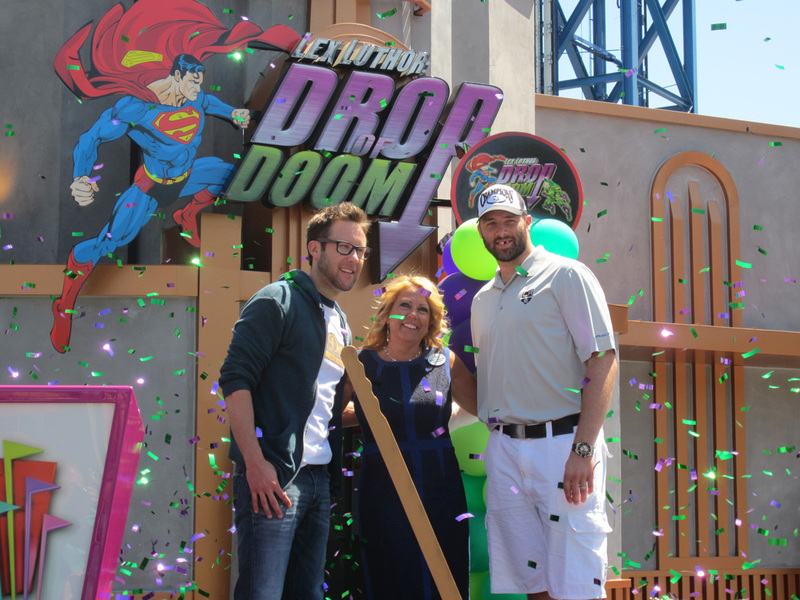 So not only is the DC section better linked by location, they’re literally linked because of the impressive engineering of the Drop of Doom. It’s actually built directly onto the tower of Superman’s ride! 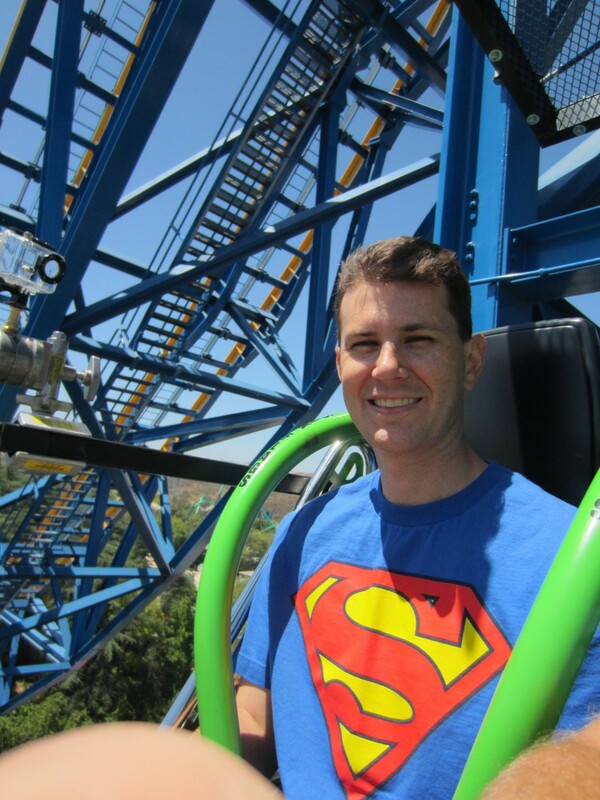 Each side of Superman’s vertical spire has had an 8-seat car attached to it on a 400-foot tall rail. Connecting these 2 rides to the same infrastructure is a stellar use of space, efficiency, and theming. 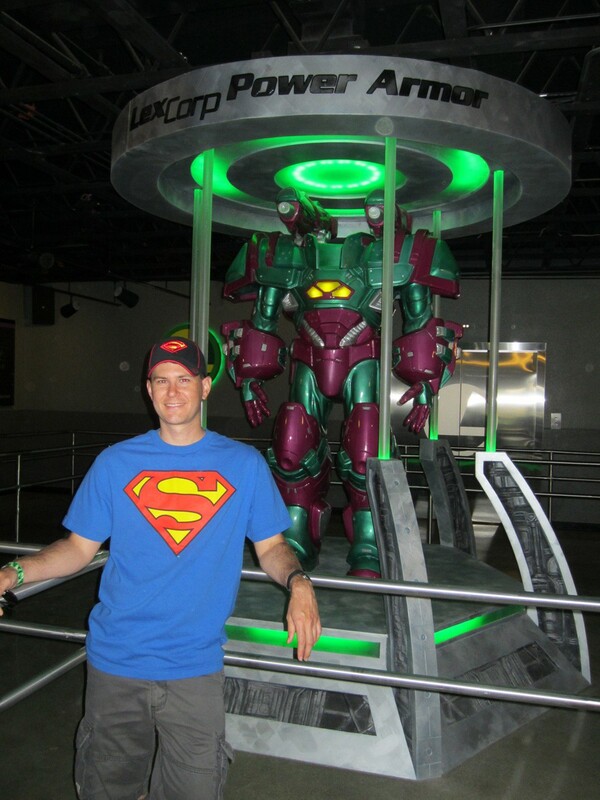 Beyond the scientific achievement, you know have Lex Luthor’s ride competing with Superman’s ride at 400 feet in the air! Like a real clash between the two arch-enemies. Whoever thought it up should be congratulated. The ride’s line is housed mainly indoors. This accomplishes 2 things. First, it’s air-conditioned, which is always welcomed at Magic Mountain. 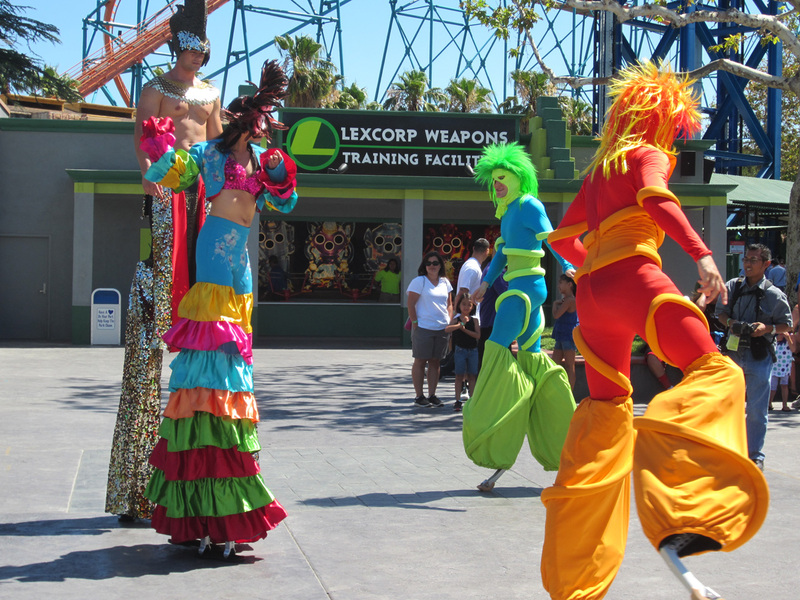 Second, it mostly keeps the very loud noise of Superman’s launch away from you–until the last few feet of line, where you head outside before getting into the seats. 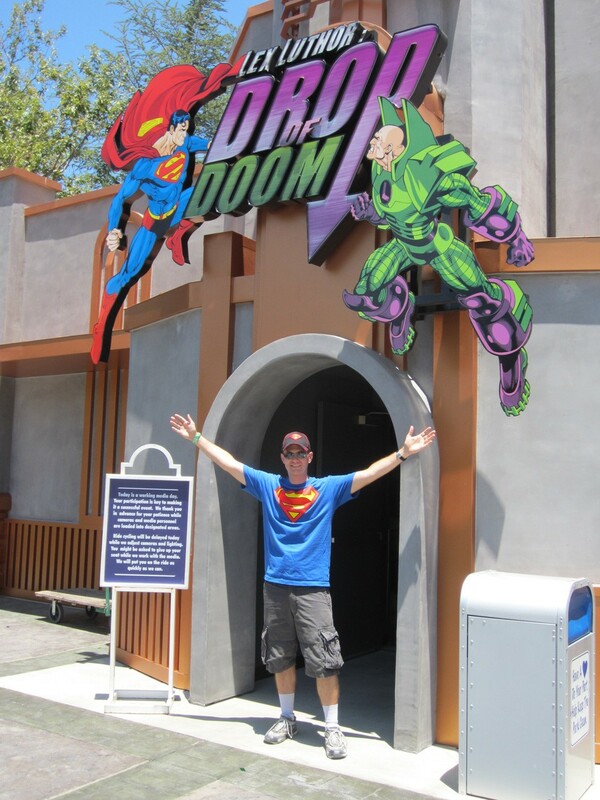 (Note: Superman was not running at the time of my review, so I didn’t hear the noise while in line. Having heard it before though, I can say this will be quite loud at the Lex Luthor line, so it’s great that most of the line is inside). 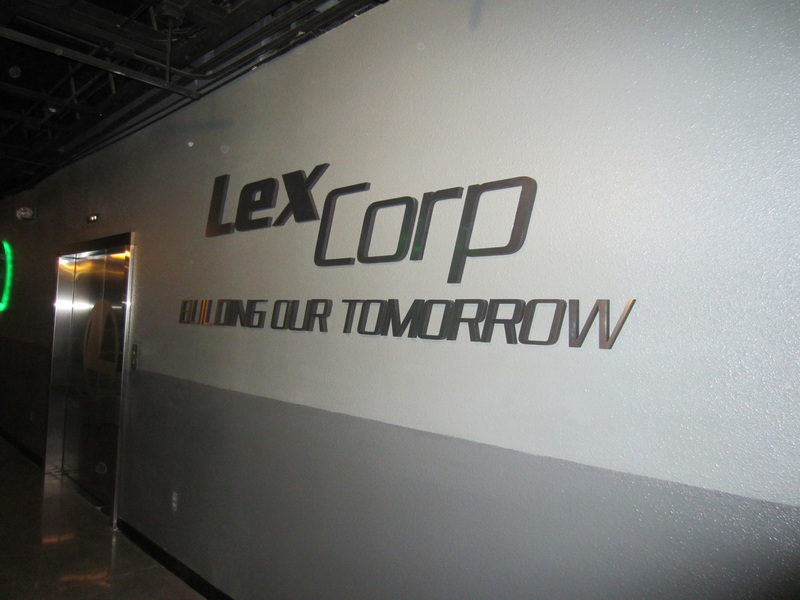 While sparse, the interior of the building is plastered with LexCorp propaganda, with a life-size Power Suit in the center of the room, that Lex uses to get on somewhat even footing with the Man of Steel when they fight. Finally, the ride itself. After sitting in very comfortable chair, you slowly start to rise straight up. You soon think “This is quite high.” Then you look over and see that you’re still even with the curved section of Superman and not even to the vertical part. 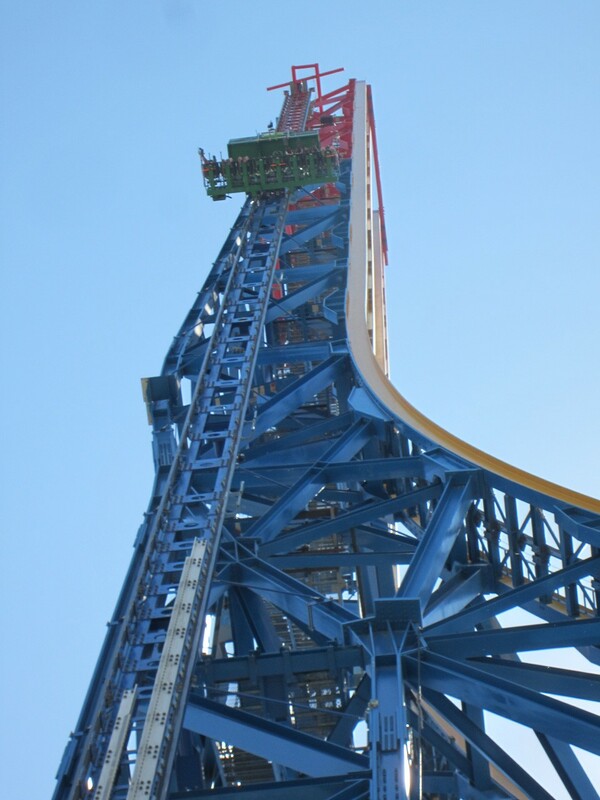 Once you clear the brakes at the bottom, your ascent accelerates, and when you’re even with the top of Goliath, you think “Whoa, this is really high! 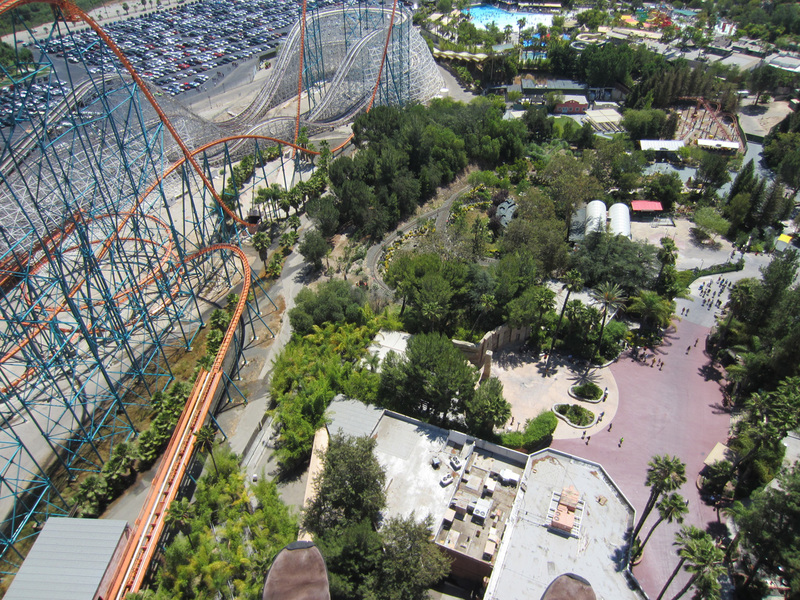 We must be at the top now!” Then you realize that Goliath is 255 feet tall, and you have another 50% of that to go. Once you can’t take it anymore and look up to see if the tower even HAS a top, you’re there, and you think “AAAAAHHHHHH….What have I gotten myself into?! ?” You are calmed slightly by the amazing view, which is soon replaced by wonderment at how small everything is. At that point, the seats “click” almost imperceptibly, and Lex Luthor’s voice chortles some trash talk at you. I forget what he says because I was busy panicking. 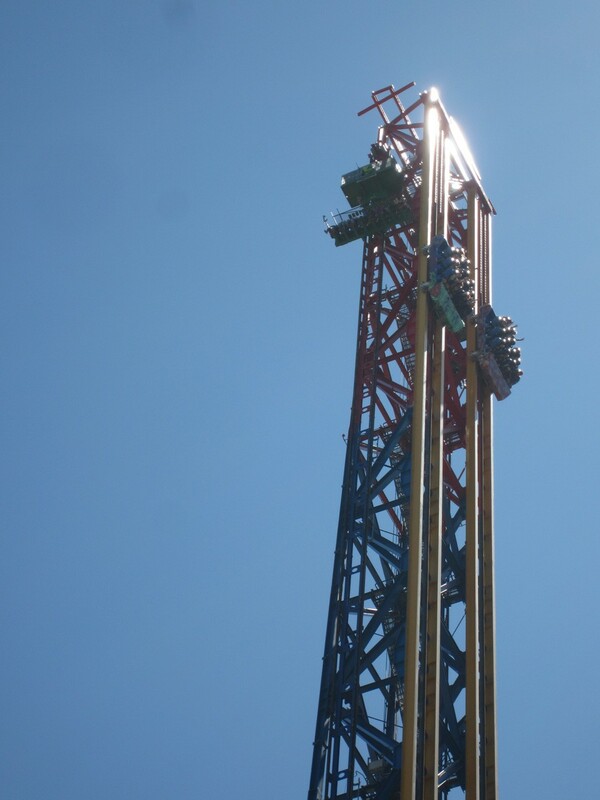 The drop is sudden, smooth, FAST, and terrifying. I swear it felt like I was pushed downward, but no, this ride operates solely on gravity. No outside assistance. 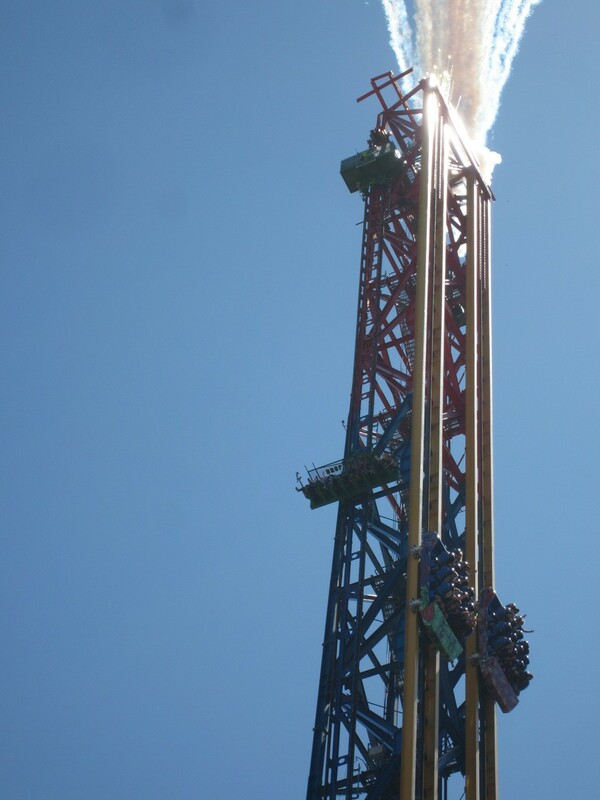 The freefall lasts longer than any drop ride in the world. It’s long enough to actually get your bearings, and yet still so short that you never get accustomed to falling. The sensation is literally breathtaking for the entire trip down. The brakes at the bottom are very gentle. You don’t get jerked to a stop at all, and soon enough, you’re back at the bottom, with uncontrollable laughter/relief sweeping over you. I rode it three times, and would have been happy to ride it 10 more. I especially would like to try it at night, and with Superman’s ride in operation. I think it would be a blast to look over at one of Superman’s cars as we both start down the tower at the same time. There are no faults with the ride. It is the best of its kind that exists. 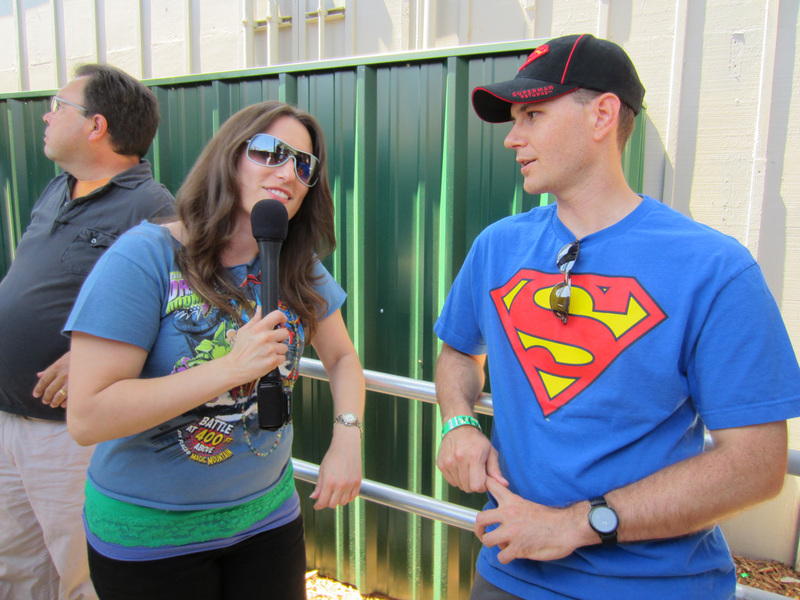 I do not know what the wait time will be, or how much of a nuisance the noise from Superman will be. The only reason I’m giving this 9 instead of 10 is that it’s just so much shorter than most rides. I know this can’t be helped…well, not until they build one 800 feet tall. Fun, awesome article! Reminds me a lot of when I rode it for the first time. The only drop I had ever been on before this one was a frog-like one at some silly circus, and it was stupid and small, but even then I was scared (it was years ago), and I hadn’t gone on a drop since then. 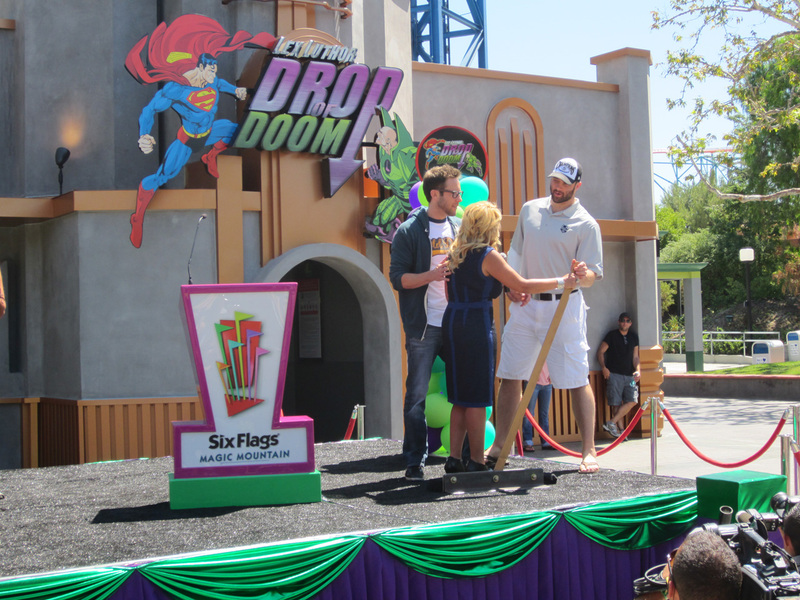 I went to Magic Mountain with my cousins, and for most of the time the Drop of Doom was being closed because the line was so incredibly long. 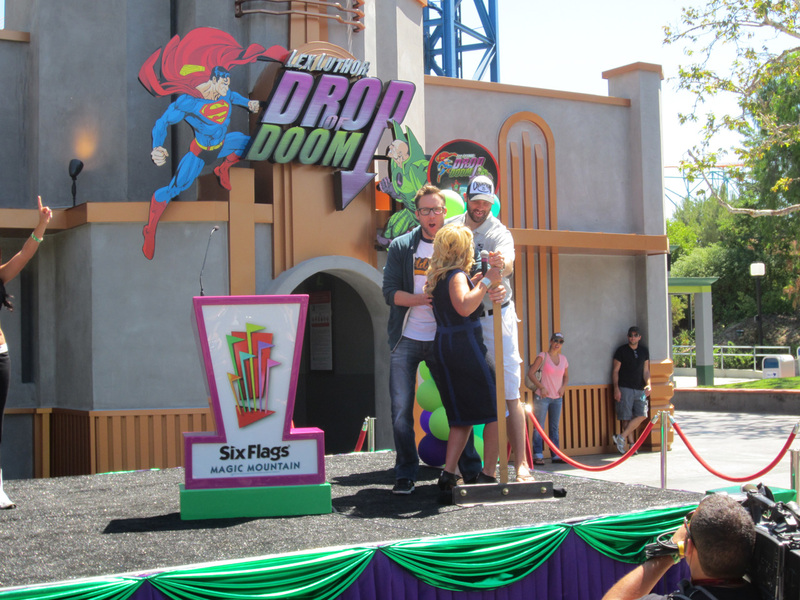 But just before we had decided to leave after riding almost every ride, the Drop of Doom was open, so we got in–I had decided that if I was here, I had to do it, regardless of my fear for drops of any kind. And rarely have I been happier with a decision like that, because it’s a ride I will NEVER forget. Oh, and I thought I’d mention there was a great deal of profanity between my cousins and I on the way up, right after getting strapped in and realizing we couldn’t get off, haha! Thank goodness they don’t give you that option! Thanks for the comment. Glad you liked the article and the ride!